In the last few decades there has been an enormous redistribution of wealth globally. 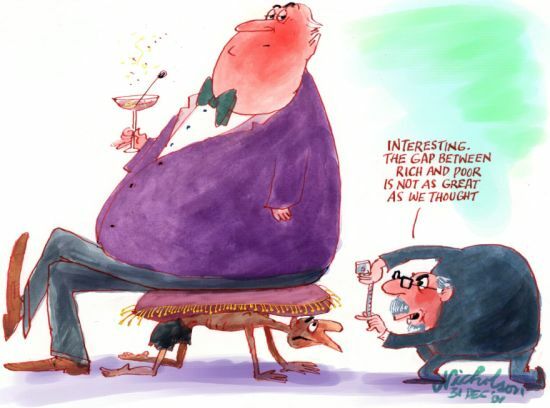 Fewer than 85 people own half the world’s wealth. There is another slightly larger stratum below them who own most of what is left, and the rest of us, the ones who are not too poor to be actually starving like the poorest one billion, get to scrabble and fight over the crumbs left in between. The wealth of the one percent richest people in the world amounts to 65 times the total wealth of the bottom half of the world’s population. In the post-financial crisis since 2009, the top one percent captured 95 percent of the wealth, while the bottom 90 percent became poorer. FACT ~ 0.000012% of the population of the world owns half it’s wealth. This new feudalism invalidates our apparent democracy, our access to human rights, our aspirations towards freedom. It makes a mockery of the moral imperative to work to provide a decent standard of living for your dependents. Because with almost all of the world’s wealth snarled up by outrageously rich and bloated oligarchs, the rest of us can never know economic freedom. We will always be scrabbling about in the dirt. We are not governed by those we seem to elect. We are governed by the wealth of these hidden few. They are not some secret society or hidden illuminati…though such may also exist. No, they are far more visible. They are simply human beings who’s morbid greed knows no bounds. They are insulated from environmental degradation, poverty, war, the petty troubles of our daily lives. They can not imagine what it would be like to be us. But they pull the strings in Government through the long arms of their multiple corporations, and thus they influence every minor aspect of our lives. We are their vassals and serfs, just as much as the landless peasants were the minions of the feudal lords long ago. We read about those ancient societies and wonder why people put up with such brutal discrimination, and yet we put our heads down like lowly beasts and put up with it ourselves. And in turn we get our minor pleasures off the labour of those who are in a state of worse enslavement than us, the out-castes of the feudal society who bleed for us to make our gadgets and sweet indulgences. And the feudal overlords promote the idea that it is the sick and the old and those who are unemployed that have us on our knees, pitching one half of an enslaved society against the other half as we grizzle and scuffle over the bones the masters throw from their tables. They poison us deliberately, keep us distracted, so that we do not look over the heaving spread they have set before themselves and ask why is this! Maybe if we work hard enough, we are led to think, we can turn straw into gold…. This is not new, I know. We all know it. Nor is it a conspiracy. It is backed up by fact. Wealth is invented out of thin air by the Federal Reserve or the European Central Bank, or such institutions. It is not backed up by Gold or worth of any kind. It is ethereal almost, appearing as zeros on a screen. The first people who filter those zeros through their ”accounts” are the ones who reap the spending power of those magical zeros. They are the already super-wealthy. They use this puff of steam to purchase the actual resources that create actual wealth. They buy land, ores, mining rights, factories and industrial production chains, seeds, technology, the air space, the rights to water, the very birth rights of every citizen on this planet, and then they let those zeros trickle down to the masses where they are discovered to now be worthless. But too late. We see their zeros are worthless by the time they trickle down to us, leaving us capable of getting only enough to feed us and provide enough pleasure to keep us doped up. By now they have already used this imaginary wealth to whip away farms and natural resources so that our only possible access to the means of production of wealth is to step up to one of their conveyor belts and put our noses to their grind stone. It does not matter whether that conveyor belt is in the Public Service, the Private Economy or so-called Self-Employment, any freedom we experience there is completely illusory. I don’t know what can be done about any of this. To set the clock on imaginary wealth to hour zero would still leave this tiny minority in charge of the means of production, so they would be alright. Perhaps the only solution is as Albert Camus advised…..